After the 25 January Revolution in 2011 staff and students managed to expand democracy and independence on many Egyptian university campuses. However, since the ouster of former president, Mohammed Morsi, in July 2013, many of these gains have been reversed in the name of combating the Muslim Brotherhood. Long before the bombings which killed a police officer at Cairo University in April 2014, the Egyptian security forces had turned Egyptian universities into war zones: storming the campuses to arrest hundreds and shooting students dead during protests birdshot and live bullets. According to Egyptian and international human rights organisations, it is the security forces who bear prime responsibility for the violence. An Amnesty International report released in January 2014 highlighted the crackdown on students as a key example of what the organisation calls “state violence on an unprecedented scale”. The Association for Freedom of Thought and Expression (AFTE), an Egyptian NGO, has documented almost daily occurrences of violent attacks by the police on students and harsh jail sentences given to student protesters. 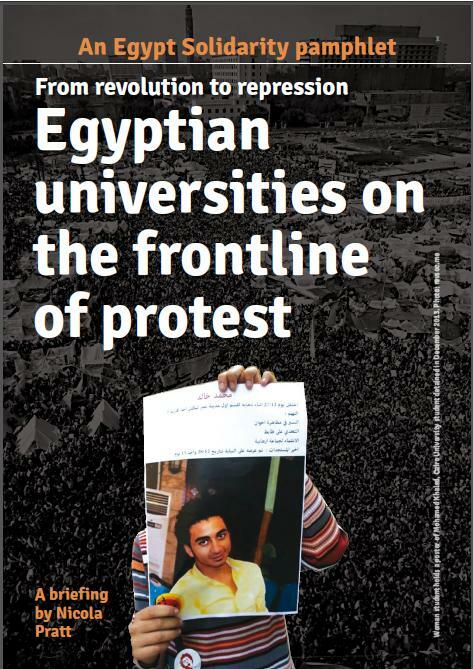 Our 16-page briefing, Egyptian Universities on the Frontline of Protest is available to read online (click here to download a pdf). Pass a resolution through your student union or trade union condemning the crackdown on student protests. A model motion is available here.